Well, do I just jump right in and act like I haven’t been absent the last five months? Life has been crazy, folks. I finished grad school, started a new job, and we bought a house. Between adjusting to my new schedule and getting settled in the house (that’s a post for another day), there hasn’t been time for much else; I feel like I’m coming out of a few months of survival mode. Not to mention that I’m getting used to a new kitchen and the stove and I aren’t getting along quite yet. After years of an electric range, cooking with gas is…different, and I’ve managed to both burn and undercook lots of things – sometimes both at once. We’re getting there, though. Life is settling, the important rooms in the house are painted, and I baked a darn good cake in the new oven yesterday. I’m looking forward to normalcy again. And that about catches us up to now. It’s been a cold and dry winter and Jeth has been busy out on the University’s organic farm. A big part of his day is shepherding so he spends his hours hauling hay and moving sheep. Farm work is not gentle on hands, and the winter weather doesn’t help, either. The poor guy’s hands have been dry and cracked for weeks. 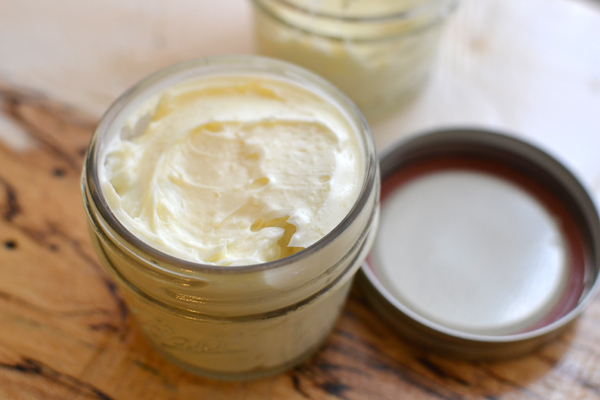 I whipped up a batch of really moisturizing homemade hand cream for him, since I think the fragrances and alcohols in store-bought lotions can sometimes be kind of drying. This hand cream was really simple; I started by making a basic salve from oil and beeswax. Salves are really moisturizing, but they can take a while to absorb into the skin and leave your hands oily in the meantime. I ended up taking the recipe a step further and turned it into a whipped hand cream. The difference between a salve and a hand cream is the addition of water. Emulsifying the melted oil and beeswax with some water makes a thick cream that absorbs much better. The beeswax in the recipe leaves a nice moisture-trapping barrier on the skin. If you are into using essential oils, either for fragrance or for health purposes, this would be a great recipe to add a few drops of EO to. We didn’t need this cream to have any particular healing properties, so I left it out this time. I’ve seen lavender, geranium, and myrhh used pretty frequently in hand cream/salve – and I’ve had good personal experiences using lavender oil for burns and irritated skin. Melt the beeswax and oils together in the top of a double boiler, or in a glass measuring cup placed into a small pot of simmering water. Be careful not to let any water splash into the oils, especially if you are planning to just make a salve, since oil and water aren’t friendly unless you really whip them together. Stir until the beeswax and solid oils are totally melted and the liquid is clear. For salve: Pour the oil and wax mixture into a 1/2 cup mason jar and let cool until the mixture is solid. 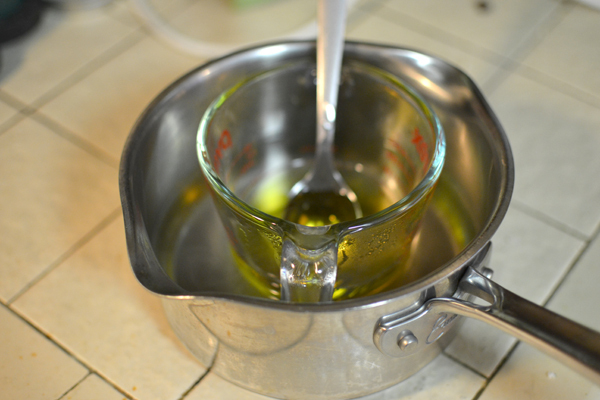 To make cream: While the oils and beeswax melt in the double boiler, pour 1/4 cup of water into a small mixing bowl. Get a whisk or mixer ready since you will be beating the oil mixture into the water. Oil and water normally resist each other, so you have to beat them together really quickly before the oil starts to cool and solidify, otherwise the cream will end up separating. Once the oil is warm and melted, start quickly beating the water to get it moving. Gradually add the oil mixture to the water in a thin, steady stream. For a minute it will look like a failed, separated mess, but keep beating and the mixture should lighten up and come together just fine. Keep beating it for another minute after it starts to look like lotion, just to make sure every last drop of water and oil is well mixed. Let the cream cool to room temperature, and then give it one last quick stir or whisk to make it light and fluffy before spooning it into small mason jars. Tags: natural body care, recipe. Bookmark the permalink.